This symposium focuses on musical repertoires from the Caribbean. Presentations of musical traditions specific to Trinidad will be followed by talks from regional composers writing music for concert performance today. By presenting a musical mosaic in this way, the symposium aims to draw connections between traditional and new musical forms and to inspire discussion about how and why composers incorporate local styles in their work. Following on from the highly successful International Symposium held at the College of The Bahamas in February 2013, this event will be of academic and musical significance to anyone interested in the new music currently being created in the region. Guest speakers include eminent composers, arrangers and performers working across the Caribbean and beyond. The featured local composers all either have Trinidadian heritage or write music directly influenced by the nation’s culture in some way. The symposium also draws on the expertise of many members of the UTT APA Music Faculty. The Symposium is planned to coincide with the week of the premiere of Jab Molassie by Dominique Le Gendre and Caitlyn Kamminga. The first performance of this significant new work from Trinidad provides the perfect partner event for the Symposium, and it is envisaged that patrons of the International Symposium will want to attend a performance of it on either the first or second evening of the event (Saturday 8th or Sunday 9th November). Delegates should pay upon arrival at the International Symposium where facilities will be in place to accept payment by credit card or by Linx. Delegates should arrange their own flights and accommodation. 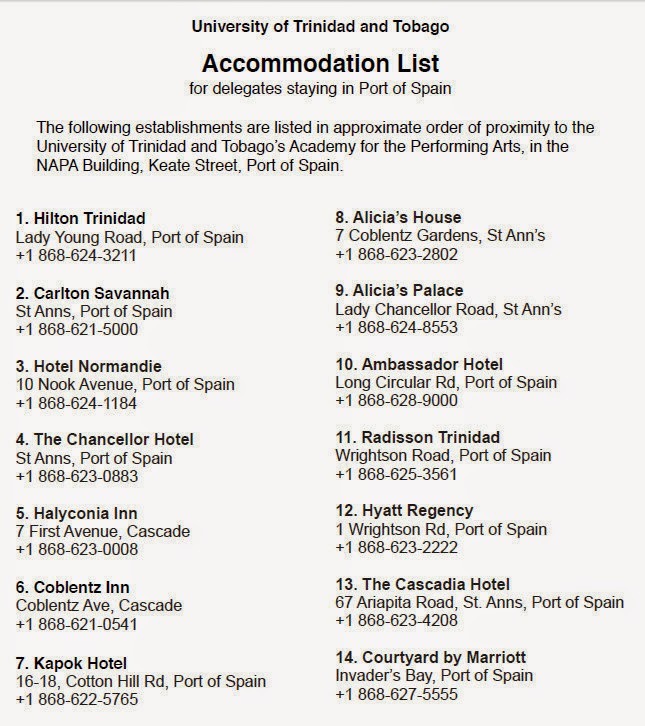 A list of hotels in Port of Spain is attached with this email. The International Symposium can arrange transportation from the airport to Port of Spain.